Rig To Ranch Sweepstakes: Win A $25,000 Family Dream Vacation! 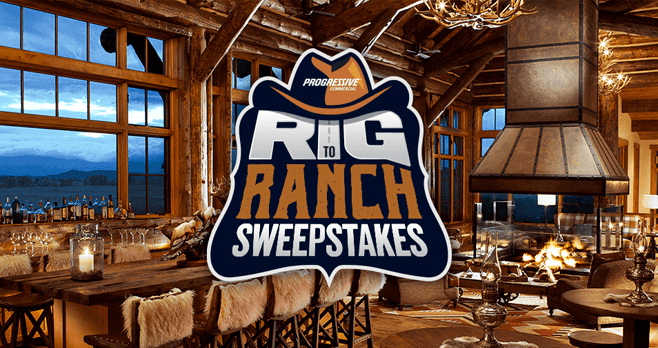 Progressive Commercial wants to reward hard working American truckers and their family by introducing the first-ever Rig To Ranch Sweepstakes, at RigToRanch.com, featuring the grand prize of a $25,000 family dream vacation at America’s #1 Resort – Brush Creek Ranch. It’s the vacation you’ve always dreamed of. You and your family will have the opportunity to enjoy Deluxe Amenities, Gourmet Dining, Family Activities, and Outdoor Excursions. The grand prize also includes airfare for four, standard rooms at Brush Creek Ranch with all-inclusive accommodations for four nights, and more. Enter today and every day through May 1, 2017 at RigToRanch.com for your chance to win. Eligibility: The Progressive Commercial Rig To Ranch Sweepstakes is open only to legal residents of the 50 United States and the District of Columbia, who have a valid Class A commercial driver’s license, and who are at least 18 (except Alabama and Nebraska must be at least 19 and Mississippi must be at least 21) years of age or older as of date of entry. Sweepstakes Period: Begins at 9:00:00 AM ET on March 16, 2017 and ends at 4:59:59 PM ET on May 1, 2017. Limit: Limit of one Entry per person, per email address, per day throughout the Promotion Period when you enter online. Limit of 3 Sweepstakes Entries per person, per email address, throughout the Event Entry Period via the Mid-America Trucking Show. Limit of up to 20 additional Sweepstakes Entries per person for the length of the Promotion Period. Random Drawing: On or about May 2, 2017, there will be one Grand Prize drawing conducted from among all eligible Sweepstakes Entries received for all Weekly Drawings during the entire Promotion Period. The total ARV of all prizes is $27,600. Winner’s List: To receive the list of winners of prizes, send a #10 self-addressed, stamped envelope for receipt by May 15, 2017 to: Rig to Ranch Winners List Request, c/o Realtime Media, 200 Four Falls Corporate Center, Suite 100, Conshohocken, PA 19428. Sponsor: Progressive Casualty Insurance Company, 6300 Wilson Mills Road, Mayfield Village, Ohio 44143. Administrator: Realtime Media LLC, 200 Four Falls Corporate Center, Suite 100, Conshohocken, PA 19428.